On March 19, 2011, the United States, France and the United Kingdom launched attacks on Libyan defensive infrastructure and ground forces. With a war against Libya underway and violent turmoil within the country, is the Obama Administration still deporting Libyan nationals and requiring visitors and students to abide by visa restrictions to return to the warzone? We hope not. But one glance at the USCIS site, and there is currently no press statement or policy in place for nationals from Libya who may be in the United States currently visiting or studying. Granted the population of Libyans in the United States is probably minuscule when compared to populations in the rest of Europe, but that is all the more reason for the Department of Homeland Security to come out with a statement or policy immediately. 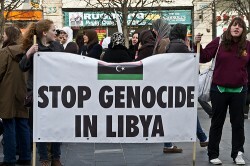 India has stopped the deportation of a Libyan student in light of the conflict. Canada has followed suit and stayed the deportations of all Libyan nationals until the violence and political unrest in their homeland subsides. This is not unusual or unprecedented. USCIS usually grants Temporary Protected Status (TPS) for countries undergoing armed conflict or a natural disaster. Last year, it was quick to grant Haiti TPS after a major earthquake rocked the country. When USCIS grants TPS, foreign nationals from the designated country are allowed to live and work in the United States for as long as TPS is in effect. However, besides TPS, the USCIS can also grant visa extensions or deferred enforced departures. For example, at this time, DHS has determined that Japanese foreign nationals living and residing in the United States do not require TPS. But Japanese nationals traveling either on a non-immigrant visa or through the Visa Waiver Program are now allowed up to 30 extra days to depart after the expiration date on their visa or passport. Hopefully, the conflict does not last long. In the meantime, please join us in urging the Obama Administration to grant a deferral of enforced departure for all Libyan nationals and temporary protected status to stop the removal of any Libyan nationals to Libya until it is safe to do so. ← Previous Previous post: When is the Last Time Bombing A Country Freed People?